Cloud computing is changing the economics of IT. Many organizations look to the cloud as a potential cost-savings boon by moving internally hosted IT services to external hosting providers. Other IT organizations view the cloud as a potential disaster recovery plan or as on-demand capacity to boost business continuity and customer service levels. But cloud computing suffers from confusion and hype. Multiple definitions, competing vendor offerings, undefined risks, and new business models obscure cloud computing, slowing down adoption. 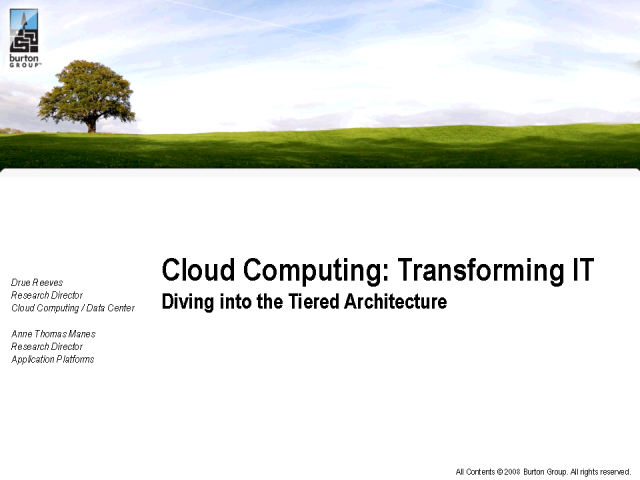 Insightful IT organizations are taking a closer look: What is the cloud computing business case? How do I ensure cloud computing will pay off? What are the business risks of using cloud computing? How does our IT organization get there from here? At Catalyst 2009, Burton Group will shine a light on this important subject, and help IT organizations gain insight into important cloud issues, answer key questions and leverage the cloud to create a competitive business advantage.